Rated PG-13 for momentary violence and sexuality. Adventures In Paradise, 18 May 2005 Author: Lechuguilla from Dallas, Texas Visually, this film could serve as a cinematic poster for a Mediterranean cruise. Cinematographer Henri Decae draws us into the film with its alluring Italian locales and gorgeous panoramic vistas. Bright, complementary hues and high color contrast translate into eye-popping reds and yellows. And, of course, there's the deep blue color of the sea, and a brilliant sunlit sky. Such is the setting for a story wherein three attractive, young adults (Tom, Philippe, and Marge) test a 3-way relationship that is far more complex than it first appears.Indeed, trouble lurks beneath the surface (so to speak), in this "Italiano paradiso" thriller. In the first forty minutes, the psychological motivations of our three beautiful people are unclear and subject to change. It's hard to tell who is doing what to whom. Subsequent to this narrative setup, we see exactly where the story is headed. 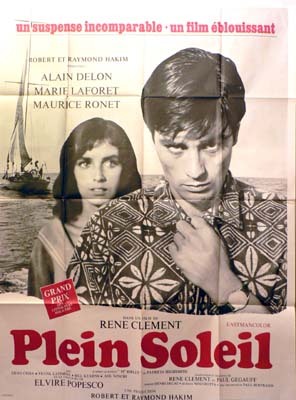 Because "Plein Soleil" is a psychodrama, casting is important. The three leads (Alain Delon, Maurice Ronet, and Marie Laforet) are all convincing in their roles.I have not read the Highsmith novel on which the screenplay was based. So I cannot make an intertextual analysis. I do think this 1960 film is superior, for various reasons, to the more recent remake. 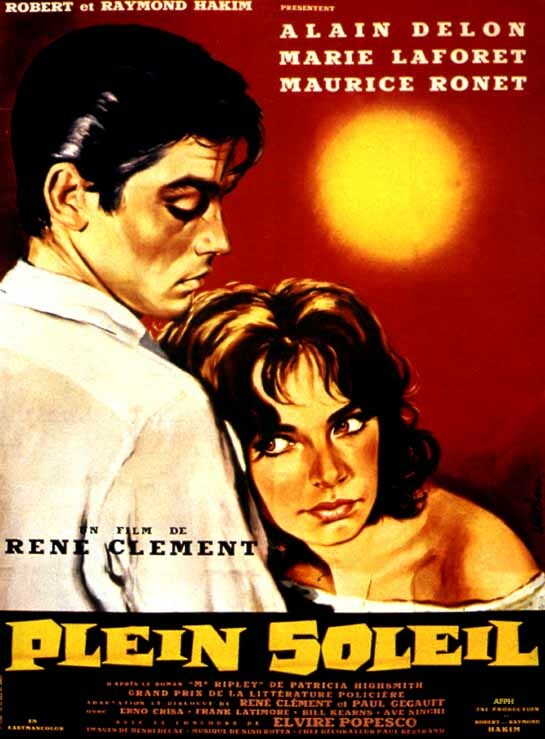 Adroitly directed by Rene Clement, with a buoyant musical score by Nino Rota, "Plein Soleil" is a character study of an amoral pleasure seeker whose charming personality masks the evil within. The juxtaposition of inwardly criminal intent with outwardly idyllic scenes of Italy and the Mediterranean results is an art house film that is both picturesque and suspenseful. It's a film that appeals both to our eyes and to our brains.